At least 18 people died when a train derailed during heavy monsoon rains in western India, officials say. The passenger train came off the tracks as it crossed a river near the Konkan coast in western Maharashtra state at around 0610 local time (0140 GMT). Local people helped passengers trapped in carriages hanging from the bridge in Raigad district, correspondents say. The engine fell into the river. 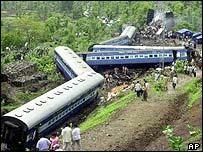 The train was said to have been travelling from Mangalore to Bombay. Reports said the derailment, between Veer and Karanjadi, 200km (125 miles) to the south of Bombay (also known as Mumbai), was caused by boulders that had fallen on to the tracks in the rains.